A group of Donetsk citizens have expressed their initiative to conduct a meeting in support of unity and sovereignty of Ukraine on Soborna square (monument of St.Michael) at 15.00. .
Today, March 8, at 10:00 a demonstration was held. It started off near the Drama Theater. Chanting "Referendum, "Gubarev" the residents of Mariupol marched along on Lenin Avenue. On the 8 of March several thousands people were gathered together on Lenin Square in the center of Donetsk City in order to speak up for support of referendum about the future of Donetsk Region. Several hundred people moved from Lenin Square in Donets towards DRSA in order to storm it, as reported by Novosti Donbassa correspondent play by play. .
Three policemen have been hospitalized because of grenade explosion in Police Office of Donetsk Kirovsky District, as reported to Ukrainsky Novyny by Igor Demin , Press-Service Chief of Donetsk Region Main Police Office. . In Donetsk the joint meeting of supporters of the detainee of the leader of the pro-Russian activists Pavel Gubarev, participants of the movement "East Front", and members of Ukrainian Communist Party began. The role of mass media within the civil life of the region has to grow considerably. This is what the governor Sergei Taruta said today during a meeting with the heads of the foreign policy departments of Denmark and Sweden. On the 6 March the police several times stopped the attempt of the next assault of Donetsk Region State Administration Building. During two weeks the situation in Donetsk will change totally - said Sergiy Taruta the Governor of Donetsk Region State Administration (DRSA), answering the questions of foreign journalists on Thursday. The seizure of DRSA was possible also because the main regional "forces" could not react to the occurred situation adequately , especially to act for its prevention, as stated by Sergiy Taruta the Governor of DRSA. In the morning of 6 March 2014, a number of sources reported the arrest of Pavel Gubarev, leader of Donestk separatists. 200 people held a meeting close to the headquarters of the SSU (Security Service of Ukraine) in Donetsk. They demanded their leader Pavel Gubarev be released. Donetsk Separatist Leader Pavel Gubarev was arrested. This was reported by Novosti Donbassa`s source in law enforcements. Sergey Taruta: "Putin is creating a problem in Ukraine, to become a peacemaker"
About 100 ultras "Shakhtar" were delivered in Donetsk Voroshilov district police station on March 5th in the evening. This happened after a mass rally for the unity and independence of Ukraine took place that evening on Lenin Square. Based on different data from 7 to10 thousand people participated in the rally for the unity of Ukraine that took place at Lenin`s Square. In Donetsk 7 people requested medical assistance after the clashes between the union of Ukraine supporters and pro-Russia activists. 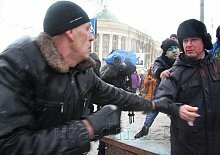 The people involved in the scuffle in Donetsk on March 5 were not seriously injured. Maksim, Kirindiasov, told this today at a press-conference. On the 6th of March at the entrance to the building of the Donetsk Regional Council there are servicemen of the criminal investigation unit wearing civilian clothes. The premises of the TV channel "Donbas" in Donetsk and those of the regional state television are now under the protection of the police.